So last week I was busying myself with fleshing out Soane's N.W. extension which is different from his earlier work at the Bank in some interesting ways. The banking halls (ultimately 5 of them) were all top lit and built using domes and vaults. The N.E. extension (orange in my diagrams) was something of a jigsaw puzzle, or perhaps a Rubiks Cube, where the various elements had to be shuffled around in space and time in order to make the best use of the available space while keeping the bank operations going. The land acquired to the North West was not at all rectangular, but there was more room to maneuver this time, and much less need to reconfigure or relocate existing functions. So he was able to come up with a scheme that was essentially a series of rectangular rooms arranged around two rectangular courtyards. As a result he was able to use conventional side lighting and pitched roofs for most of this work. I spent a small amount of time developing the facades of the garden court and the entrance court, which by now were looking a little blank. Soane did some work in these areas, but their character still owes a great deal to Sampson and Taylor, so I didn't want to linger two long. I decided that the sash window families I had developed for the two N.W. courts could be adapted for use in the N.E. extension, which is also inward looking. Here the two courtyards are really one space, but partially divided by a row of columns and a change of levels. Soane's first schemes for this extension show a narrow strip of residential accommodation along Lothbury (R), an awkward 5-sided lump subdivided into Banking Halls (B) and an even more awkward passage to bring in the bullion deliveries. He had to move the passage so that he could connect the new banking halls to the existing ones that he had just rebuilt. His solution to this geometrical puzzle was to move the Library (L1 to L2). Now he could create two nice rectangular areas. The smaller one (on top of the existing passage) would become the Consols Transfer Office. The larger one would become the two-part courtyard. As a bonus, he was able to move the Bullion Gate over to the centre of his new screen wall and strike a perpendicular axis straight into the centre of the Bullion Court. His final trick was to rebuild one wall of this Court as an arc with its centre point at the end of the new axis. You may want to applaud at this point. In passing we can note the wedge of green property which was to be bought later on, and the section of Princes Street which would be closed off and incorporated into the bank. The next picture is a section through the Residence Court, which I had to flesh out with windows, and the window family that I developed for the ground floor. I've roughly sketched in the smaller ones that will be needed for the upper levels. The Bullion Gate comes in a couple of metres below ground floor level and about a metre above the cellar floor. Hence the split levels between Lothbury Court and Residence Court, skillfully handled with a row of columns as mentioned before. These are residences for senior staff, by the way. Four storey houses were common for the upper middle class in London. Kitchens in the basement, living rooms on the ground, bedrooms above, and servants in the attic. The Residence Court has a sharp corner, and as usual Soane negotiates this with a curve. As a result, one of the windows on the end wall overlaps into this curve and creates some rather odd Revit behaviour. The cut opening fails to break through the curved portion, fair enough, but when I made a section box view to look at this area more closely, the straight bit of wall flips into wireframe mode. This doesn't happen in other views, so I haven't let it distract me just yet. Just a quick shot of my working plan for the ground level. This has a large jpeg below it of a plan by C R Cockerell, who succeeded Soane as architect to the Bank. It's probably the best record we have of the state of the bank just after Soane retired. I have set walls to transparent pink so that it's easy to compare my work with that plan. You can never get things to line up 100% but I don't think I'm doing too badly. Eventually the Residence Court is shaping up quite well. Still a couple of windows missing on the curve (marked with a cross) I think I will try replacing the opening cut with a void to see if that will penetrate the curve. Also there is a parapet with stone balusters to work out, but first I wanted to tackle the Porter's Lodge. Not too much to say about this. Like the Printer's Court, it's deliberately downplayed architecturally. Round headed recesses and shallow pilasters with very simple mouldings, top and bottom. Plus a very simple shallow pediment. Interesting to compare the external and internal facades of this small rectangular block. Grandiose and formal versus plain and somewhat domestic. Once more I have left some of the openings as plain voids, just to keep things moving in the time available. Another of my working views shows greyed out walls, and pads in thick dark red. The ground slopes diagonally across the whole of the bank, with Tivoli Corner as the low point. The cellars cut into this natural level to different degrees and some of the courtyards may even lift it up a little. I have to figure this out as I go, so I will have multiple pads, some touching each other and sometimes irregular in shape. As you probably know, pads are very sensitive to even the tiniest overlap, so it's useful to have a view where you can see them clearly. Here's a shot from Lothbury Court towards Residence Court. At some point I realised that the stairs going down to cellar level were not central, amazing how you can miss things in a photograph that you have looked at dozens of times. Then once you've seen it you wonder how. This is basically like an archive, rows and rows of files on four levels. Soane basically copied the existing building in a new location. It's very repetitive: rows of arches and groin vaults with a light well slot going down the middle. Basically 4 slices of cellar stacked on top of each other. Once more you can see the working views: transparency applied to model elements, jpeg scaled up to life size. Section through the library showing how it buts up to the screen wall. On the left-hand side you can see the Consols Transfer Office which is separated from the library by a small triangular court. I'll finish off with a sliced off 3d of the whole area. You can see three banking halls in the bottom right. 1 = Stock Office, 2 = Old Shutting Room, 3 = Consols Transfer Office. I've framed the two rounded corners that Soane used to mask the different angles of the Screen Wall. Remember this section of wall was to be the model for the entire enclosing structure that he was only to complete in his late 70s. And notice how the curved corner at the top right has become swallowed up by the works of the N.W. extension. Letter R represents the Residence Court and the arrows down the middle show the Bullion route. Actually, that's not quite the end. I want to show you this plan view with an applied colour scheme. Pale Pink is for Banking Halls, Pale Blue is the Court Suite, Grey is Back of House/Offices/etc. Yellow highlights circulation space. Note the way that the Rotunda organises the South-East banking halls while skillfully linking the entrance court to the side entrance of Bartholomew Way. Also note the Long Passage that Soane created to link a discreet but Grand "back door" to the Court Suite. And in orange we have the primary reason for this plan: to mark the position of staircases, points of vertical circulation. These are restricted to the north and west for a simple reason. The south and east is dominated by single storey Banking Halls. And the very last image is an update of the birds-eye view that I created long ago to give an overview of the bank, expressed as 5 zones. You can see that I've started to place simple markers to represent chimney stacks from the many fireplaces and solid fuel stoves. Once again I am struck by the way this building has become an old friend, a familiar story book, packed with nuance and intrigue. Project Soane has been woefully neglected so far this year. I had hoped to keep my momentum going, but it hasn't quite worked out that way. Not enough hours in the day, or days in the week. But I have managed to put in a little work over the past 2 weekends, tackling the North West extension that completed the territorial expansion of the bank. The new build of the NW Extension is colour coded green. The Pink areas towards the bottom left are parts of the building that predate Soane. And bottom right, outlined in cyan is the corner of the NE Extension , basically the original junction between Princes Street and Lothbury. One result of the NW Extension is that Princes St gets straightened out so that it meets Lothbury further along at Tivoli Corner. The Lothbury facade gets doubled up, mirrored about a hinge point indicated by the asterisk here. The mirrored copy of the Bullion Gate becomes the soldiers gate (small arrow to the right) which gives access to the Barracks (B) This is down at the lower level. Above the barracks are new printing works, fitted into the angle behind Tivoli Corner and arranged around the Printing Court (PC). This court is closed off to the south by the new Accountants Office (A), a rather grand space with large Ionic columns and a shallow barrel vaulted ceiling. Top middle is the new VIP entrance, leading into the Doric Vestibule, and a long passage that eventually takes a dog-leg to the right. Eventually another right turn takes you to some waiting rooms in the old part of the bank, and a new Governor's suite. The governor's new office faces into Waiting Room Court (WRC) so that he can watch visitors as they start their journey down the long passage, accompanied by one of the pink-coated beadles. This is a classic piece of Soane originality. 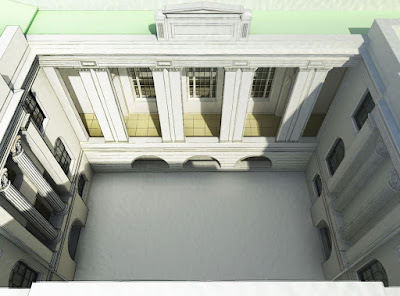 The passage is open to the court on one side, framed into bays by pairs of highly abstracted giant pilasters. He explored several more conventional treatments before hitting on this solution. This is typical of Soane. He did the same thing with Tivoli Corner, trying out all kinds of treatments before the problem settled down in his head and he achieved the clarity of vision he was seeking. The stern Greek formality of the Waiting Room Court contrasts sharply with the much more homely, brick arches used in the Printing Court. Here Soane adopts his standard "low-rental" mode, as you would expect in a back-of-house area. The image below is far from complete, but it gives an indication of the difference in feeling. When I work on this kind of project, exploring a historical period or a vernacular style, I find that many of the same issues come up as when working on a fee-earning job in an architectural office, but the difference in context is informative. In that sense it becomes a very useful learning experience, quite apart from its intrinsic value. For example there is the whole question of how to quickly sketch things out using a tool like Revit. In this case I started out by representing the various openings as simple voids cut out of the walls. These can easily be parametric families because of the simplicity of the shapes, so it's possible to "feel your way" to the correct size and proportions if that information is not readily available as legible dimensions on the drawings. The next stage in my "design process" typically involves building non-parametric families for the sizes that I have established in stage 1. My second stage, "fleshed out" families for the arched windows use extrusions for the glazing bars. These are modelled directly in the family (no nested components) and each extrusion contains perhaps 30 line segments. So this would quickly break if you tried to flex the family, as you can see in the next image, which also illustrates the "trace-over" method. I'm using images from the archive, dragged into family editor, scaling them to match the size deduced in stage 1 and cross-checking against any stated dimensions in the archive drawings. This snapshot image is also the source of my assertion that Printing Court is predominantly face-brick whereas photos of Waiting Room Court show it to be Portland Stone just like the rest of the Bank. We are getting to a 3-stage process of family development in order to accommodate the demands of a rapidly evolving design, or in this case a rapidly evolving "understanding" of whatever it is that I am studying with my BIM pencil. Stage 1: highly abstracted, parametric families. Stage 2: directly modelled, highly specific families. Stage 3: more detailed parametric families. In this case, the third generation families use nested components for the sliding sashes, and a series of sweeps for the glazing bars, in place of a single extrusion. The sweeps have two advantages. They are easy to lock to reference planes, and you can start with a simple rectangular profile, knowing that it's easy to elaborate this later on. The first image shows me locking the end of a "path sketch" to a reference plane, and you can also see the angled reference LINES whose ends are locked to the centre point of the arch, and to which radial glazing bars are locked. Just in passing, here is my rig for controlling the centre point as the width and height vary. By the way, I typically make one sweep, copy this around and edit it, rather than starting from scratch with the sweep command. This saves me the effort of repeatedly assigning a profile, subcategory and material parameter. I guess there are other ways to approach this. Controlling the end points of these radial elements is quite tricky. I opted to use a detail component which is rendered invisible in the project environment by unchecking the box. Looking back at this I can't quite understand why I used straight lines when circles would have been simpler. (plus more adaptable should the angle change) Anyway you just lock the detail item to the centre point and link its parameters up to the width parameter via simple formulas. I tackled the sliding sash window in an earlier post from a rather different angle: direct modelling of the way this technology works, in some detail. More than 2 years ago, and I said then that I hoped to explore how I would make a family for this kind of window that could be flexed, and used in a real project. So it was very interesting to come back and take a stab at developing a parametric version. The level of detail has to be lower of course, so what is realistic for a project that might contain dozens of instances ? That's always an intriguing question. This brings up an interesting issue which I will use to conclude this post. What is the relationship (if any) between a detailed model of a typical item like this, and the simplified version (family) that is placed in a project. It seems inherently "UN-BIM" to model these completely separately. But how would we build digital links so that they are both kept in sync, automatically. The current paradigm for fine detailing is to draft over a callout view in 2d. Now that's fair enough in many cases, but sometimes it really would be beneficial to develop a detail in 3 dimensions. It seems to me that one of the fundamental challenges as we move forwards with BIM is how to automate the synchronisation of design as we jump up and down the scale from "cupboard detail" to "typical hotel room" to "400 key hotel" to "urban district" and beyond. More on the continuing saga of Project Soane very soon.